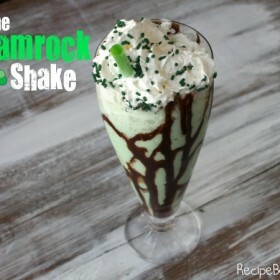 St. Patty’s Day is next Wednesday (oops… on the 17th) so I made a popular McDonald’s menu item, a Shamrock Shake. Do they still make these though? I don’t think so because my dad you used to drink them when he was a kid and that was like centuries ago. But the thing that sets my Shamrock Shake apart from the McDonald’s one is that mine had no added chemicals OR preservatives! Also I used low-fat ice cream and non-fat milk. Now please enjoy my Saint Patrick’s Day Presentation. And while you’re reading this post, please count the phrases in green. Please leave a comment with your answer at the bottom and I’ll tell you if you’re right or wrong. Just like veins of gold sometimes run through quartz, veins of chocolate run through my Shamrock Shake. Put some muscle into it Brooks! Scoop with all your strength. Eeeww!! 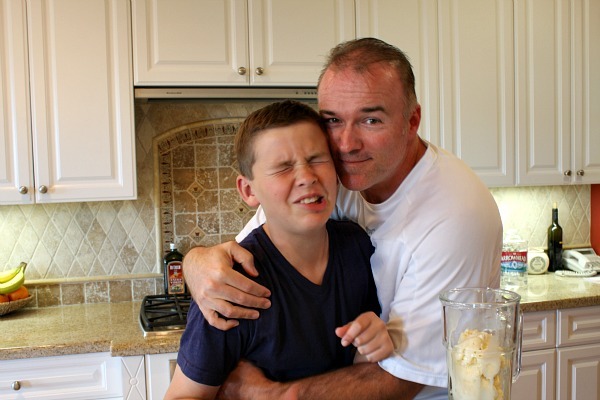 Don’t hug me in the middle of a recipe Dad. That’s my dad, squeezing all of the air out of my lungs. Eight drops of Green Food Coloring + milk + mint extract, and then blender time! 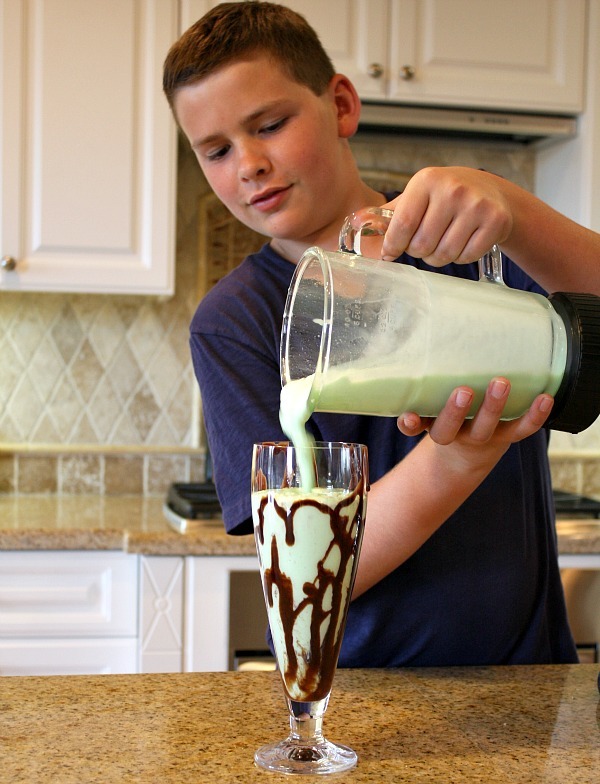 Before you put the Shamrock Shake in the glass, you need to create your veins of chocolate by squeezing the bottle of chocolate syrup while rotating the glass. Now you can pour it. 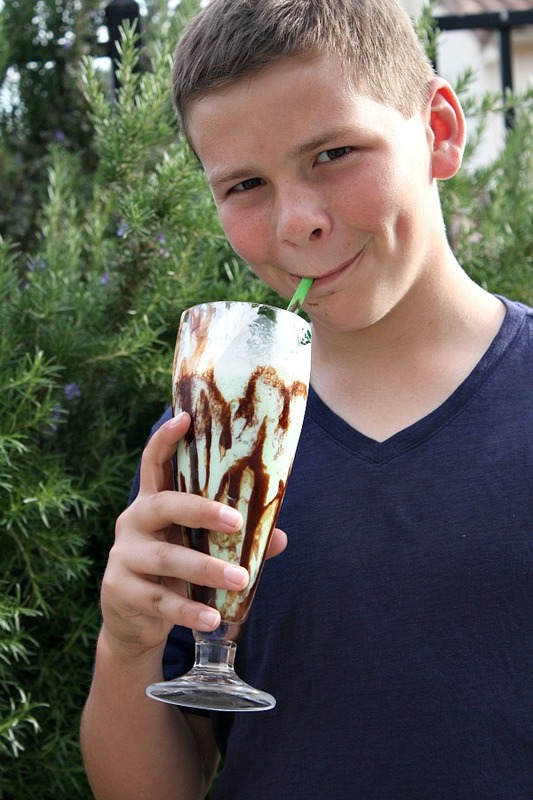 Just a warning though, after you have poured the shake in the glass, put a little more chocolate syrup in it. The veins just aren’t enough. Give it a VERY generous amount of whipped cream and then finally sprinkle the sprinkles on top. That’s what I call a Shamrock Shake! If you can’t find a McDonald’s near you that serves these, I suggest you make my version of a Shamrock Shake. I take that back now because it should be the other way around: if you can’t find the ingredients for my recipe at the store, use McDonald’s as a LAST resort. 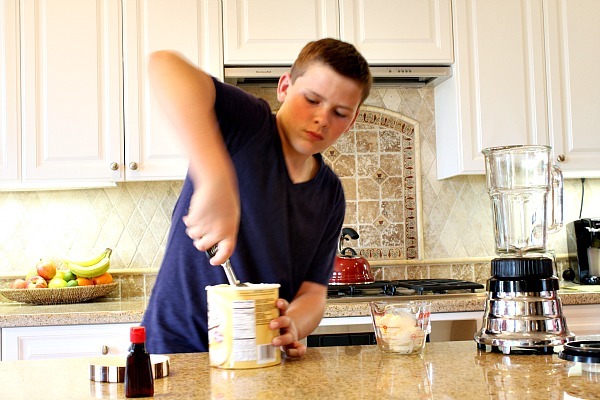 And even a kid can take a chemical-filled shake and turn it into a SUPER DELICIOUS recipe… Like Me! whipped cream and green sprinkles, if desired. 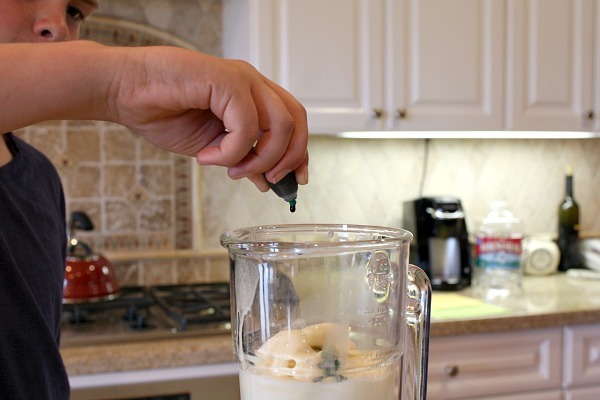 Place all ingredients in a blender and blend away. 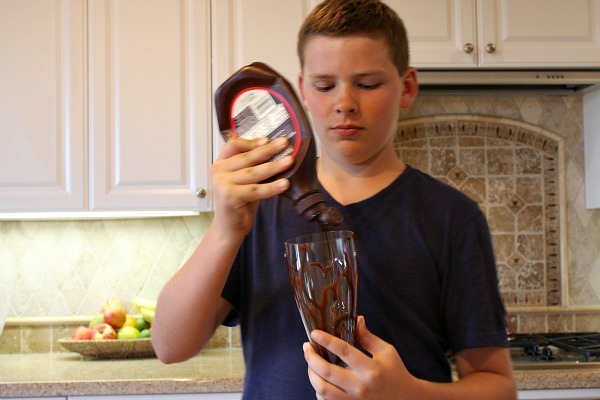 Drizzle chocolate syrup on the inside of two glasses. Divide the blended shake between the two glasses. Top with whipped cream and green sprinkles if you'd like! Sip with a straw. Hey! Down here in Texas, most of the Mickey D’s still sell the Shamrock Shakes. But yours looks more deeelish! I’ll be making this for sure. How fun!! This looks like a winning shake to me!! Perfect for St Patty’s Day!! What a great shake. Perfect for March. wow, that does looks so delish. My boys would love to make this also. I will have to make one with them on ST. Patricks day. Thanks for sharing. I can never drink these because the idea of the nasty thick green syrup they put in them just makes me want to puke. Thanks for the non-preservative alternative! Thanks for this! 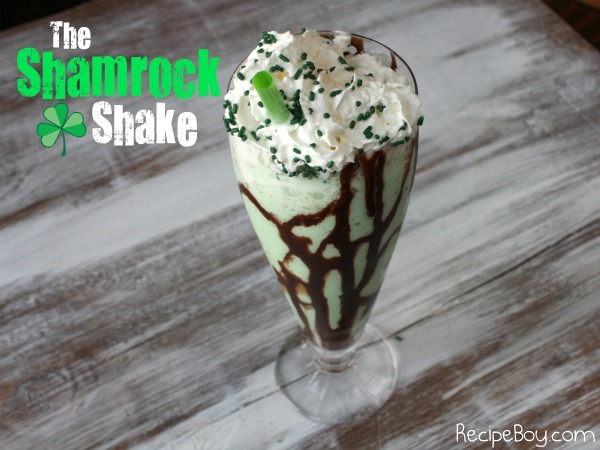 My husband and 3 year old daughter LOVE Shamrock Shakes from McDonald’s…but this is a much better alternative…one I don’t mind letting them indulge in more than once! Keep up the good work, I look forward to more of your posts and making your Twix Cheesecake! PS: Brooks is a great name…one of my favorite (and best) 3rd basemen ever…even if he was an Oriole! mm..i made these with my roomies! it was good! i found 10 phrases in green! 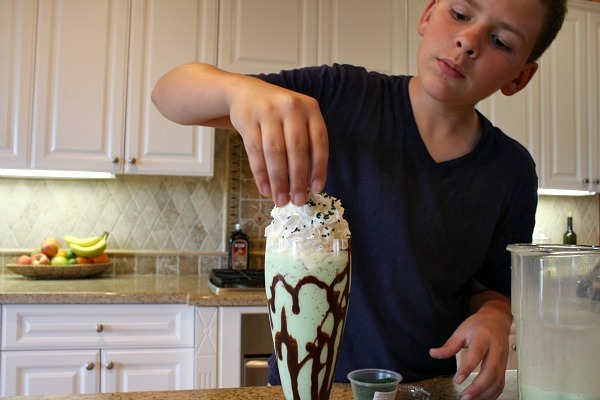 I like the shake recipe, Brooks, and I count 11 green phrases! I agree. 11 green phrases. This looks really good. Thanks for the recipe! 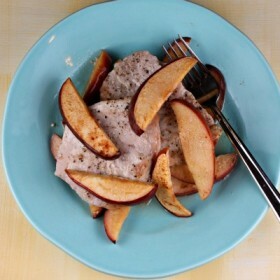 The Blond Cook featured this recipe on her face book page. How cool is this! Gives me hope in our future! Great recipe, will definitely try it out! Looks great! And look at the money you save by making it yourself. The correct answer of how many green phrases there were in this post is ten. Congrats to those of you who got it and nice try to those of you that didn’t. Thanks for commenting! I FEATURED this on my blog today! I hope you can stop by! Recipe boy! Yes, they do still serve them, in response to your question. THEY ARE SO SO SO GOOD! That Looks amazing! 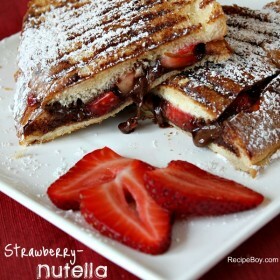 Im going to make that right now! Also your really cute ;)~! Hey, I have two questions- Can you make a chicken pot pie recipe and do you like the Patriots team?